How do I assign an appraiser to an order? An appraiser can be assigned two different ways. 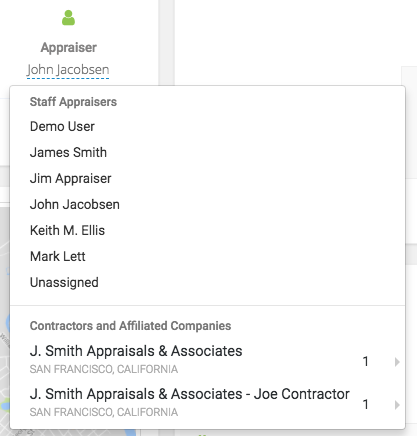 When creating a new appraisal, in the details section there is an “Assign Appraiser” dropdown. This is not required and can be left blank. Or, you can assign the appraiser here as shown in the screenshot below. The second way to assign an appraiser to a file is from the details of an appraisal already created. This is also how you can re-assign an appraiser. From your dashboard, click on the appraisal you would like to assign. Just below the address panel you will see an Appraiser field (see screenshot). Click on the dotted line and assign your appraiser here. You can also assign orders to Contractors through this field. They will receive an e-mail confirming the appraisal has been assigned to them and they can begin work on it.